Without Cristiano Ronaldo, Juventus had to postpone their hopes of becoming champions of the Italian League after they fell 1-2 at the SPAL headquarters on Saturday (13/4). Although the match against SPAL has determined Juventus’ move to become champions of the Italian league this season, the Bianconeri have chosen to rest a number of their star players. Cristiano Ronaldo, who just returned to grazing after an injury while defending Portugal national team, was not included in the squad in this match. In addition there are a number of other players that Allegri did not play in this match such as Leonardo Bonucci and Wojciech Szczesny. Juventus managed to lead 1-0 through Moise Kean in the 30th minute. Kean’s goal began with a long-range shot released by Joao Cancelo. Cancelo’s kick turned direction to Kean. 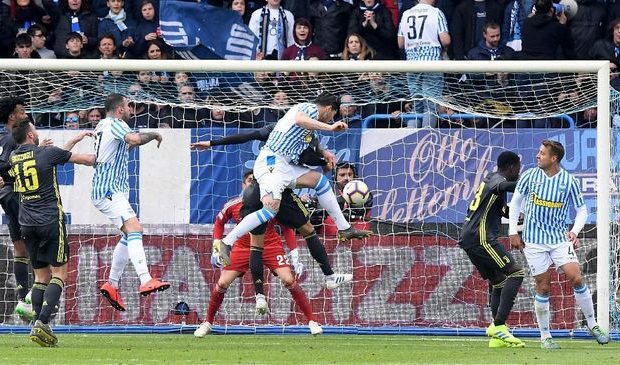 This made it difficult for the SPAL goalkeeper, Emiliano Viviano to stem the ball that went into the goal. Kean’s only goal made Juventus 1-0 ahead in the first round. But Juventus superiority broke at the beginning of the second half, precisely in the 49th minute. SPAL left back Kevin Bonifazi equalized with a header from Pasquale Schiattarella’s pass. Overall, SPAL fired more shots in this match. SPAL’s effort to add a goal finally paid off in the 74th minute. Alessandro Murgia successfully penetrated the Juventus defense line. Murgia’s efforts were then continued by Sergio Floccari. Floccari managed to take advantage of a one on one opportunity with Mattia Perin. The attacker with number 10 coolly sent the ball into the Bianconeri goal. Juventus, who hopes to secure the Italian League title this week, then substitute Federico Bernardeschi in the 81st minute to add offensive power. But the 2-1 score for SPAL lasted until the end of the match. The defeat at the SPAL headquarters made Juventus points difference with Napoli in the second position remained at 20 points. Juventus can only become champions if Napoli fail to win this week. If Napoli win over Chievo, then the difference between Juventus and Napoli will be 17 points. Juventus still have to wait until the following week to become champions of the Italian League.